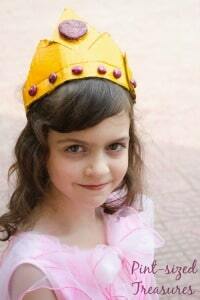 Do your girls love to dress up like princesses? Mine do too. Their love for dressing up is what inspired me to make our own unique princess crowns. Many times we buy cheap, plastic crowns from the store that break within just a few days. It was a lot more fun making our own and knowing that if we bent them a little, they wouldn’t break. 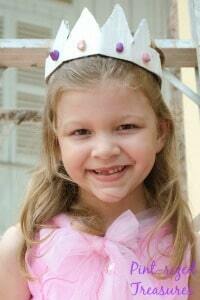 Plus, we were able to customize them to fit the smallest head of the princesses to the biggest head of the queen. The materials don’t need to be picked up at a craft store. You probably have them sitting around your house! In fact, I thought of this fun princess crown craft when I was sitting at the kitchen table teaching my daughter school. My eyes just happened to drop on an empty cardboard box and I wondered what fun craft I could create with it. We only had to buy some paint, but you may have some already at home! 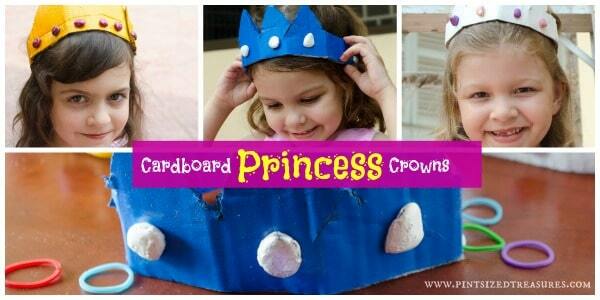 After letting the crowns dry from painting and gluing, your kids will play with these crowns for hours! I love that by just handing my kids a finished craft I can invoke imaginative play. Even my three-year-old son said, “Mom! Can I wear a crown? Boys wear crowns too!” So, of course, if you have a boy, let him wear a crown and he can be the prince or king! Lots of pretend tea parties, royal degrees and other kingly matters were played out by my kids after we finished this fun craft together. This craft has lots of variations, so add your own creative flair to make it fit your family’s personality! Got a girls birthday party coming up? This craft is sure to make all your girly guests smile! Small rectangular, cardboard boxes, like cases from soft drinks, diaper boxes or gift boxes. The sturdier the better. Small rocks or pebbles for the jewels. You can also just purchase plastic jewels at your local craft store or Dollar store. small rubber hairbands, or the bands that come with your rainbow looms. First, paint your rocks! Next, make your crown! To construct the crown, first, locate the bottom sides of the cardboard box. Choose the smallest side and begin cutting small triangles about 1 1/2 inches above the bottom of the box. Cut until you meet the edges, then continue cutting, but closer to the bottom to create the hairband part of the crown. Cut about a 4 inch band on each side that is approximately 1 inch tall. Then, slowly and carefully continue cutting the crown shape out of the box. Once you have cut your crown, then paint your crown the desired color. After it is thoroughly dry, glue on your painted rocks and jewels with your favorite adhesive. Whatever you trust to stick those rocks or jewels on and keep them there — use that one! Now, glue one stone or jewel to the end of the band on each side. 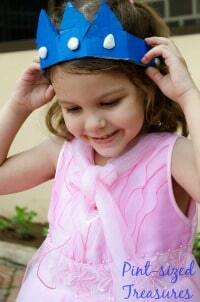 This will allow you to keep the crown snug and fit for imaginative play. If you want several children to wear it, you could glue several stones in different spots to create a more adjustable headband. Once jewels and rocks are thoroughly dried, place two small rubber bands around the jewels you glued to the back of the crown to create a flexible and fitted band. Next, slowly place on your child’s head. Once fitted correctly, she is free to go and enjoy her royal fun! Don’t forget to look back at the pictures for guidance. If you have any questions, please write and ask! 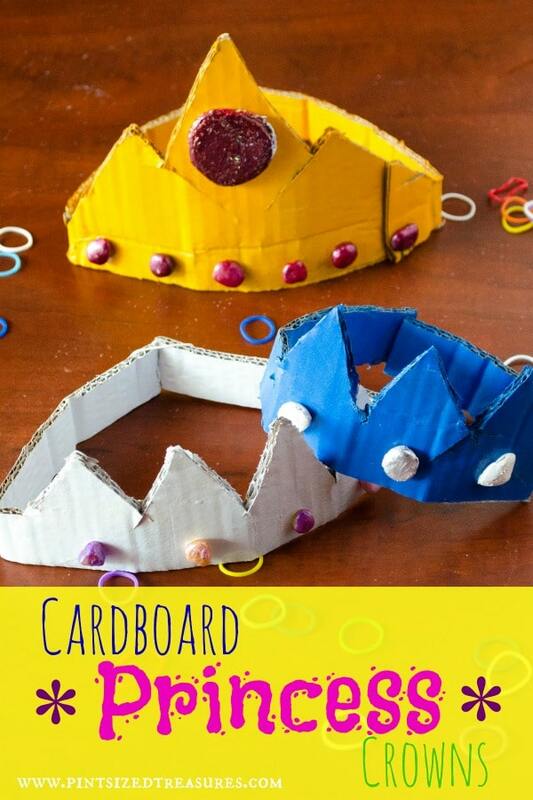 Have fun making these simple and fun crowns!